Media dinners are staged to impress yet publicists often have trouble filling a table full of food writers. We get lots of invitations. Plus, we aren’t always ready to write about each and every meal that comes our way. 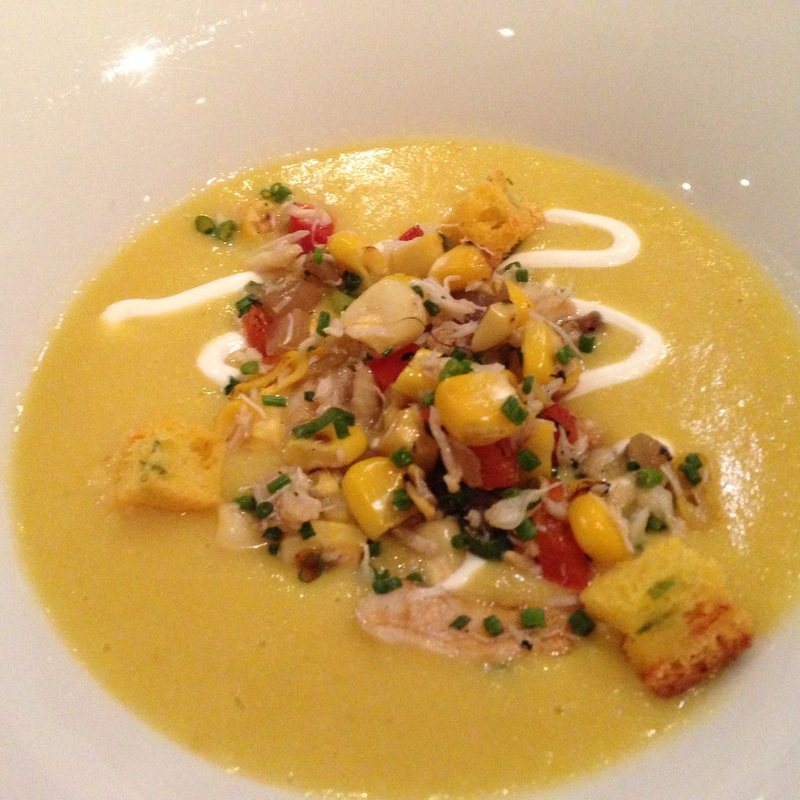 But last night’s meal at Mistura (265 Davenport Rd) is a story I want to tell. 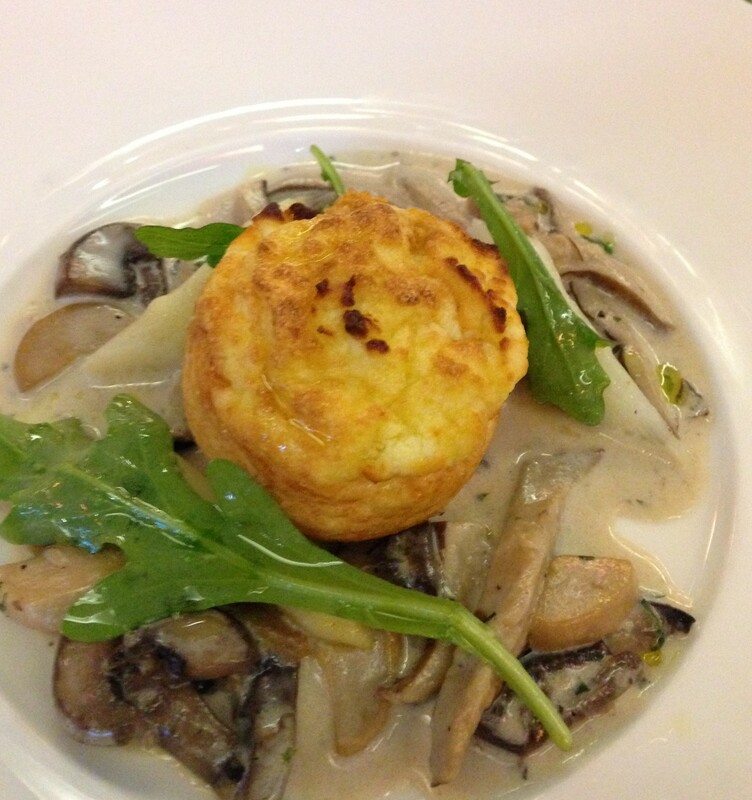 Every mouthful was remarkable and shared in the most convivial fashion. It marked the first media meal I’ve attended where the owner sat among us, introducing each dish with the kind of detail only a cook can possess, then looking out at us warmly, raising his glass in tribute and eating hungrily. I could barely stifle the swoon from my lips after devouring half of my portion in one gulp. I looked to my right and watched wine writer Tony Aspler expertly slice small, exquisite pieces while quietly rolling his eyes in ecstasy. I should have exhibited more professional control with the crispy artichoke appetizer, but it too, left my plate in seconds, swathed in a creamy, piquant sauce of fresh herbs, caper, gherkin and boiled egg. 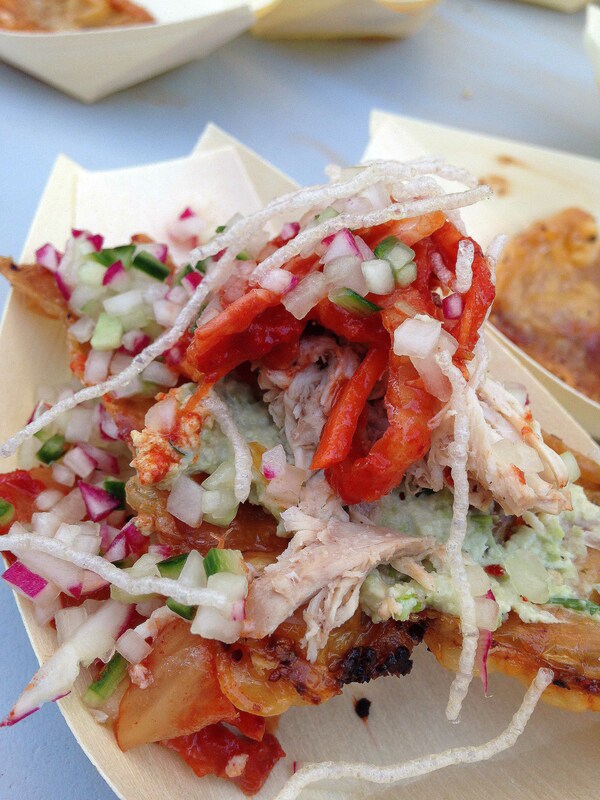 We are a jaded, opinionated bunch, tasting delicacies all across the city and around the world. Aspler had just returned from the 300th anniversary Chianti celebrations in Florence and Swaine was heading off to Wenzhou, China on a morning flight. But both had time for Mistura’s lamb ribs last night. “These are our pride and joy. You can’t find lamb ribs anywhere except here at Mistura,” proclaimed Paolini, introducing succulent, meaty ribs bathed in a sweet, finely tempered Balsamic glaze. “Where do you get them?” asked someone. “Ah, ah, ah… a butcher!” stammered Paolini, smiling broadly at his coy response. Luckily, his right hand man entered and further questioning ceased. Executive chef Klaus Rohrich was wearing a chef’s jacket and a Blue Jays cap, nervously scanning the table full of food writers. Extracted from his kitchen domain, Rohrich looked exposed and twitchy, perhaps more due to the imminent Jays’ game than our inquiring gaze. “Chef, tell us where you’ve trained?” asked the first and Rohrich murmured a muffled response about growing up cooking then entering the Mistura fold, cooking for years under the man he has now replaced: Massimo Capra. Before more questions ensued, Paolini came to his rescue, extolling Rohrich’s charcuterie skills and his ability to use local and seasonal ingredients to recreate the Italian fare that has kept Mistura in business for 20 years. 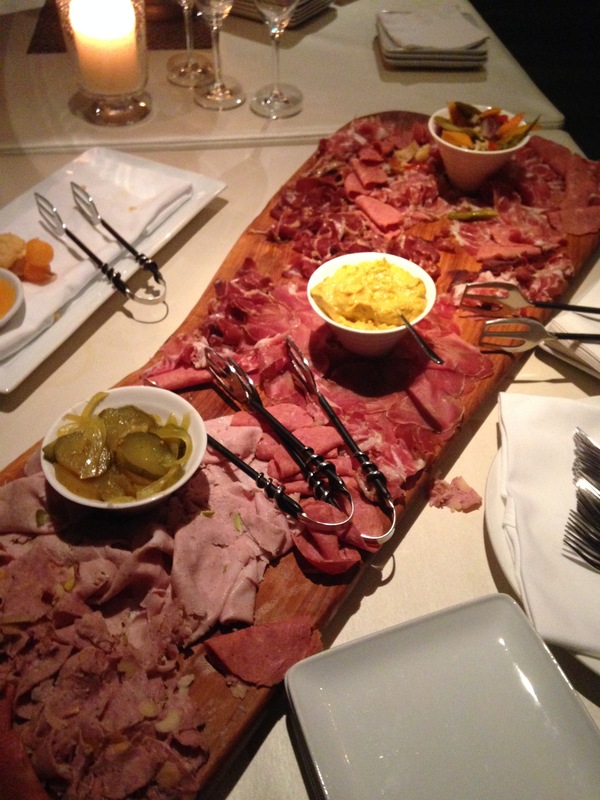 Bubbly Prosecco and a huge platter of cured duck prosciutto, bresaola, cappicola, prosciutto and bellota pata negra was set out on a table to welcome our arrival. But it was the crostini slathered in duck liver pate that captured my attention and the warm mushrooms and gorgonzola hit a close second. Pacing is a virtue that wise food critics employ at every professional opportunity but last night, I lost any workable tempo and simply dove in. 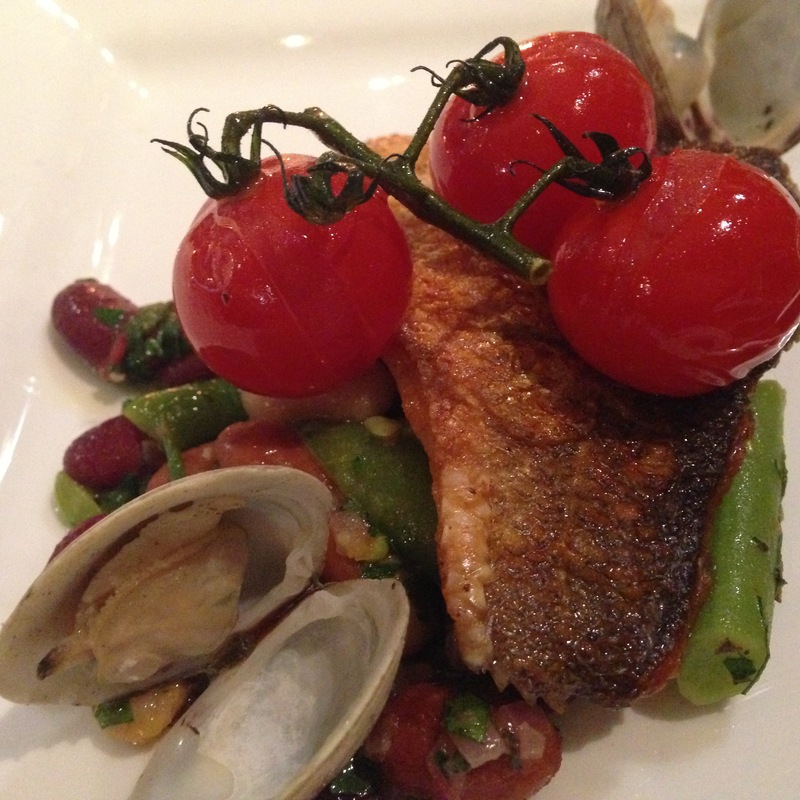 Who could blame me when the salty, crisp skin of a pan-seared Branzino beckoned, offset by plump Manilla clams and even plumper cherry tomatoes? 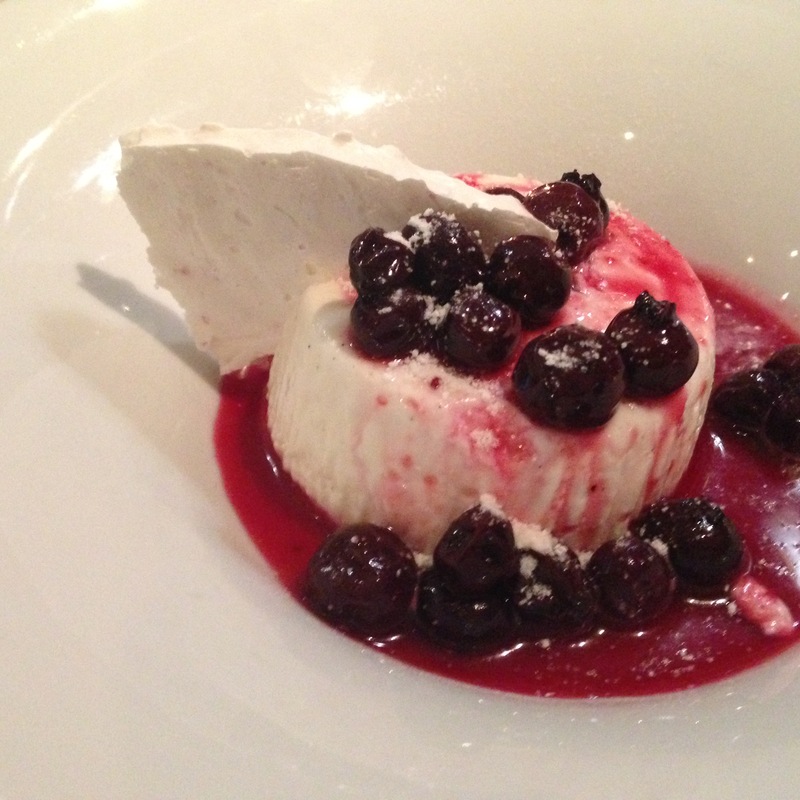 Others would say no to dessert, but again, duty called and I obediently spooned up a voluptuous vanilla panna cotta draped in a strawberry sauce and studded with blueberries. A perfect medley of thick cream and soft, whipped air, mouthful after mouthful floated down my throat in sweet, puffy clouds. 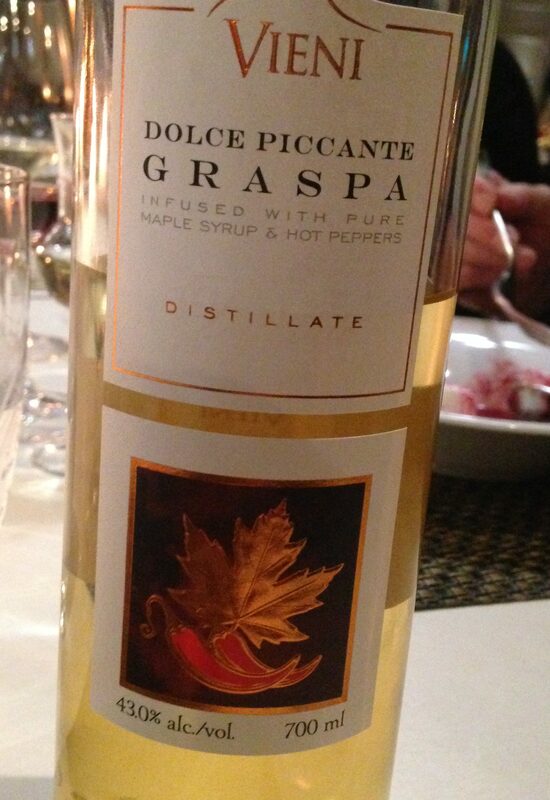 Next, Paolini offered grappa and I started to shake my head wisely in abstention until the wine writers among us voiced their interest in this first Ontario-made grappa. “You need a separate license to distill,” they intoned, knowing that grappa is a recycled liquor made from wine-making’s dregs, its flavor akin to fire water. But this delightful potion had been supplemented with maple syrup and cayenne, to create a bewitching sip of sweet heat that closed the evening’s meal like a kiss. 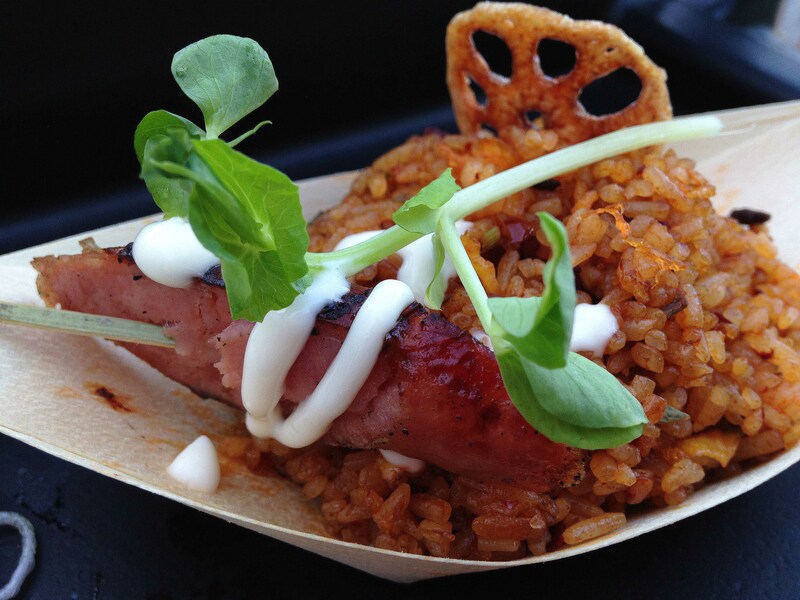 Lately I’ve been feeling out-of-touch with the trendsetters of Toronto’s vibrant food scene. 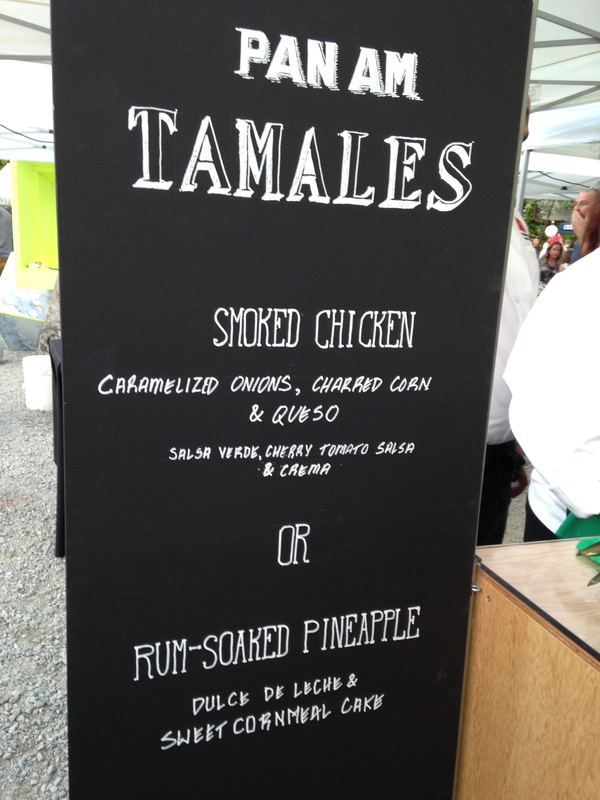 But just a few nights ago, I spent several delicious hours updating my internal food app at The Stop Night Market. I even stood in line – despite my well-known personal aversion to this urban predilection. I joined a thousand other ticket holders entering the vast, empty lot at 181 Sterling Road in Toronto’s west end and felt a gentle thrill as every line moved at a painless, carefree pace. It didn’t hurt that the evening was bathed in a warm, golden June light that put a glow on everything and everyone, including my neon yellow wristband – an all-you-can-eat ticket to sample from 47 unique food and beverage carts manned by many of Toronto’s food celebs from Momofuko Shoto to up-and-coming stars like Rasa, Branca, Dailo and Boralia . I was ready to brave the mission alone but was happily joined by yoga-buddy, neighbour and CBC radio host Gill Deacon who tapped my shoulder hello and offered to cart-cruise with me. We ambled up to a counter and found ourselves spooning up esquites or messy mouthfuls of creamy, cheesy smoked white corn spiked with chillies and lime juice. Gabriela Ituarta of Maizal explained that we weren’t eating your average peaches ‘n cream corn but an heirloom white variety grown sustainably in the Kawarthas alongside blue, black and green corns. 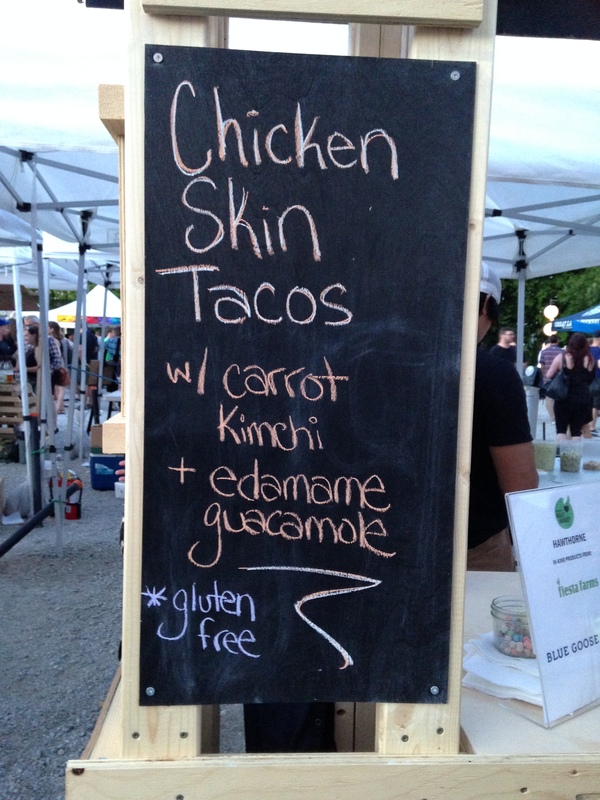 Two carts away, the aroma of Hawthorne’s signature dish beckoned: crispy chicken skin tacos piled high with braised chicken, carrot kimchi, flash-fried vermicelli and guacamole edamame (I dare you to say that three times). Gill and I kicked back our sliders in mere seconds, delighting in these unctuous, texturally divine creations. 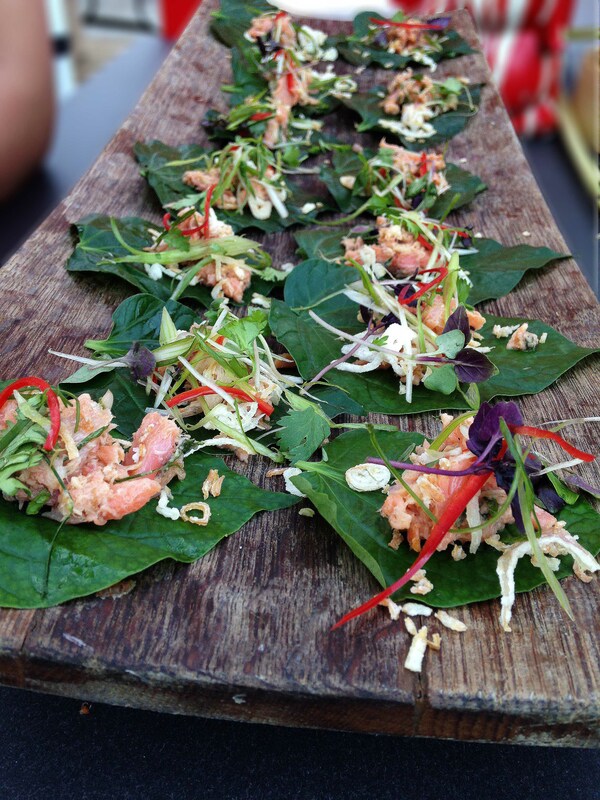 Next stop, Dailo and chef Nick Liu’s large, welcoming platter of locally produced smoked trout served on delicate betel leaves, covered in a toss of kaffir lime leaves, hot Thai peppers and coriander. Commonly used throughout Asia to wrap around highly addictive chewable betel nuts, these leaves are rarely found on the plate, yet they’re surprisingly sweet, tender and thin, providing the perfect vehicle for a sampler. Unlike many of the Night Market offerings, Dailo’s betel leaf preparation was a one-bite morsel that suited my mission to taste widely yet wisely. Night market feeding is a bit like binging on Netflix. You don’t want to stop. The pull of eye candy is immense. Yet the overwhelm factor easily sets in. 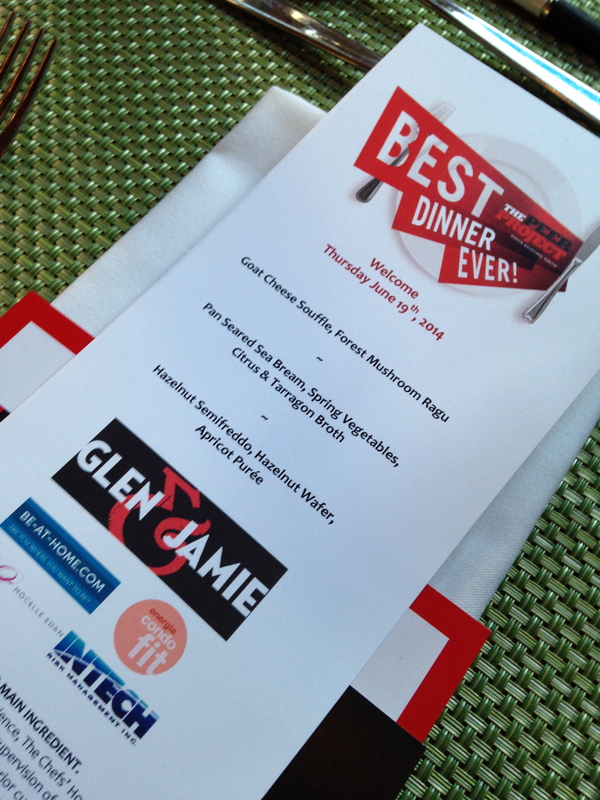 Besides, the host of the event, The Stop, is all about food consciousness. According to Kathe Rogers of The Stop, this two-night event raised $200,000 to help “fight hunger, build hope and inspire change” and sponsors such as Blue Goose (naturally raised beef, fish and chicken), Fiesta Farms, and Boulart (artisanal bread) donated raw materials to these restaurant teams that worked like mad to pump out 800 samples in a single evening. 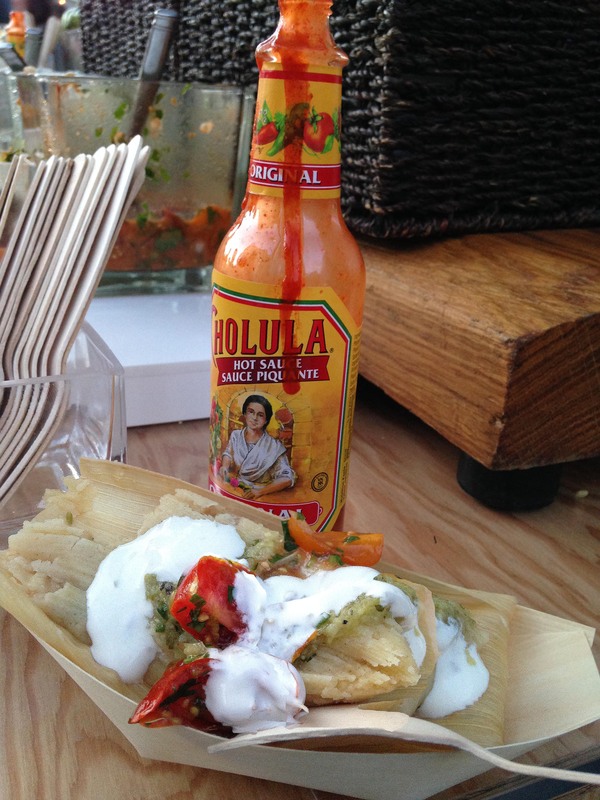 Eavesdropping at the AGO cart, I could detect a slaphappy, Red Bull induced banter among the half dozen chefs scrambling to keep the Pan American Tamale Stand operating smoothly. Yet despite the crowds and the unceasing need-to-feed, executive sous Chef Renée Bellefeuille had plenty of time to share recipes and enjoy accolades from fellow eaters. “Do not eat the corn husk,” laughed one of the chefs as I dove into smoked chicken with caramelized onions, charred corn and queso rolled inside a steamed cornmeal cake that sky-rocketed from delicious to miraculous once doused with dollops of salsa verde , cherry tomato salsa and lime crema. “Cholulu, don’t forget the cholulu. 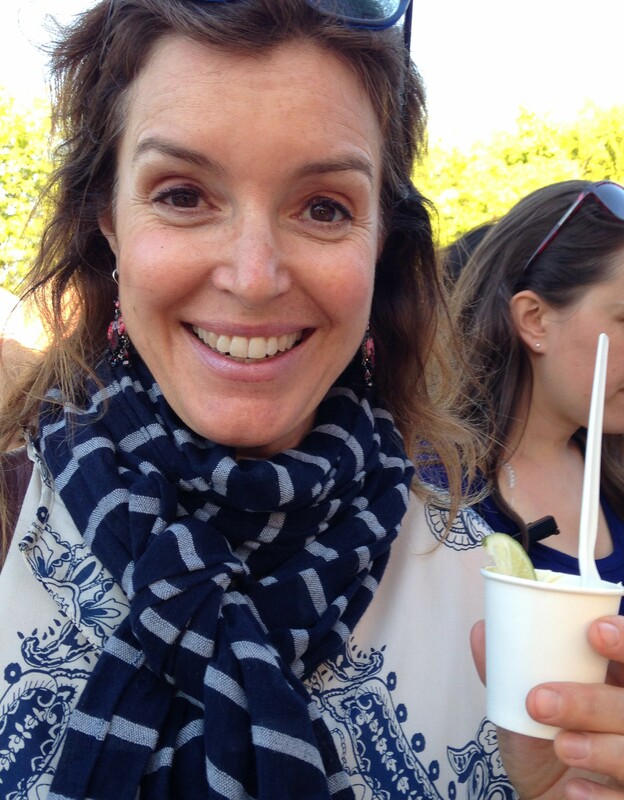 It’s my favourite,” said Renée, when she saw me lingering at the high-traffic condiment station. She also noticed that I took only one heavenly nibble of her dessert tamale with its rum soaked pineapple and caramel rivers of dulce de leche spooned over a sweet, steamy masa harina. But pacing, my friends, is the only answer to a night market feast especially when the sun starts to set, samples get lost in the shadows and chefs lose their happy-to-serve-you mojo. 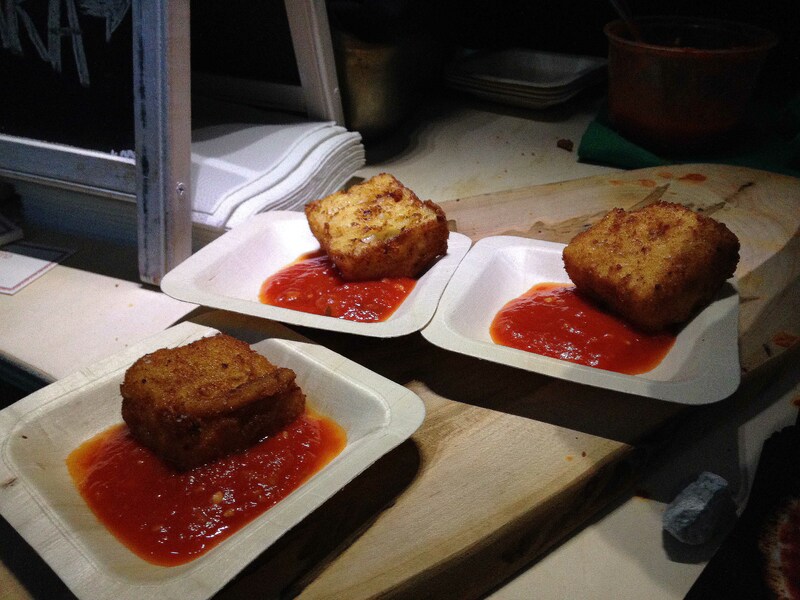 Marketing Meredith at Libretto Pizzeria was still revved up enough at sunset to provide a full introduction to frittatina, or stuffed bucatini pasta that inexplicably transformed into square cubes once tossed into the deep-fryer! They emerge with a creamy hot interior of provolone and bechamel sauce beneath a lightly battered surface. Dunked into tomato sauce, these addictive creatures are a hallmark of Libretto’s newest resto concept, A3 on College Street. And when you get to taste it all amid one thousand other happy campers, it is a win-win. We live on a lake but you’d never know it. Torontonians have been robbed of their waterside and there’s no time we feel this stronger than in the heat of summer. But there’s a culinary solution called The Rectory Café. First bonus: You get to take a boat there. The Rectory Cafe is situated on Ward’s Island and the gale of a great lake will rush through your hair if you stand on the deck. Second bonus: You’ll forget you live in Canada’s biggest metropolis and may feel a little Riviera coming on as you settle into the Rectory’s spacious patio and point your chair towards the blue, blue, blue of the lake view beyond. That’s what we did on a recent lazy Sunday afternoon. We were on our bikes and took the first ferry. No matter that it went to Centre Island. 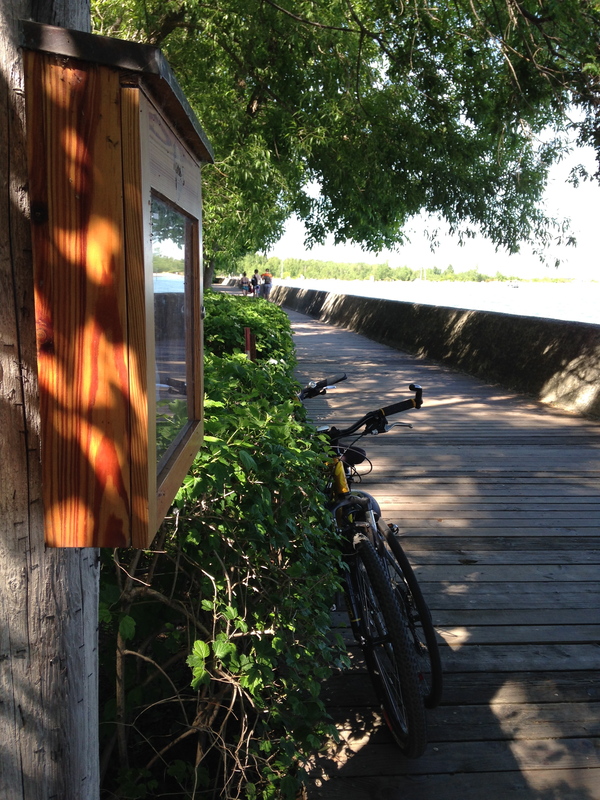 It was a 10 or 15-minute ride past all those Centreville shenanigans to Ward’s idyllic southern boardwalk. Watch for the sign, turn left and enjoy the cafe’s regal lakeside entrance. 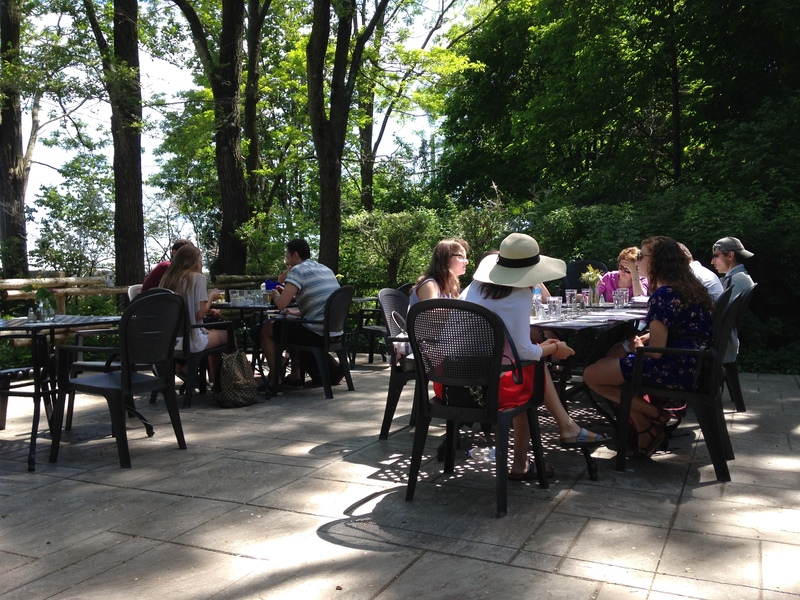 No matter if you arrive at their 11 a.m. opening or mid-afternoon, the Rectory’s kitchen keeps the place hopping all afternoon long and into the evening — especially if the weather is cooperating. 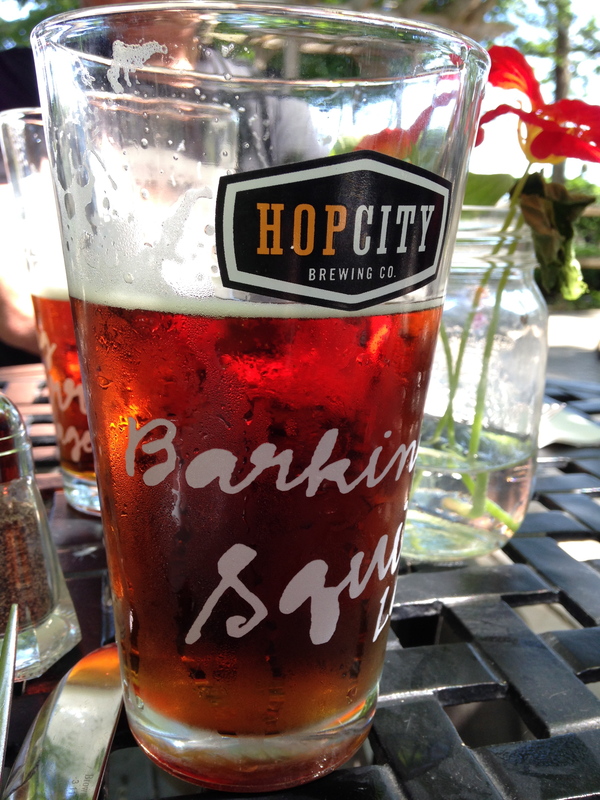 Thanks to a little inside info from the staff, we started with a tall glass of Barking Squirrel amber lager produced by Toronto microbrewery Hop City. It’s no secret that I love beer and the squirrel really satisfies with its rich burnt orange colour and what Hop City calls “noble hop aroma”. 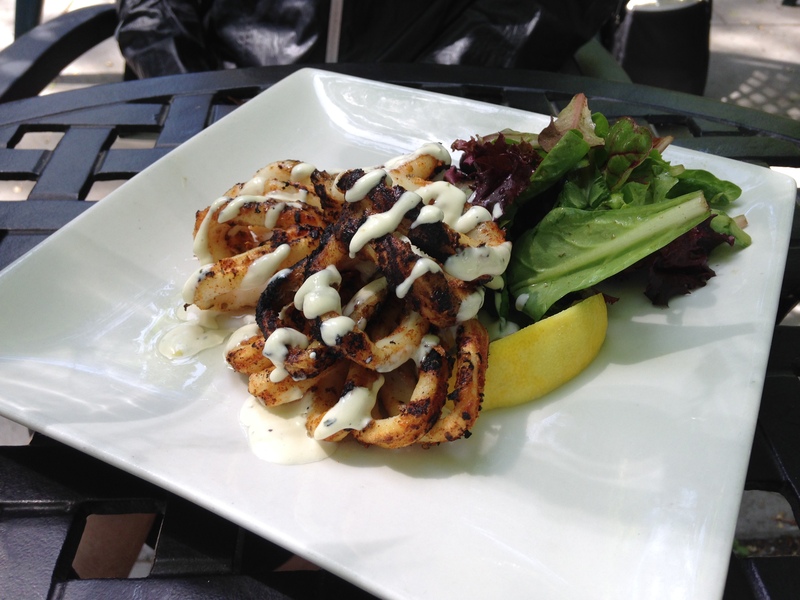 We paired this with the perfect app: Char Grilled Calamari ($12) draped in a lemon oil and scallion thyme aioli. The calamari was perky and tender to the bite, its inherently bland personality enlivened by a perfectly piquant sauce. Next, the day’s “special”. If you’re a devotee of Anthony Bourdain, you won’t go near a restaurant special but at the Rectory, it’s a must. This special was so fine, I have to apologize in advance that it’s not on the menu. Imagine the world’s best fish taco: juicy morsels of spice-rubbed Basa fillet topped with caramelized onions and salsa verde on a simple wheat taco softer than a cloud. 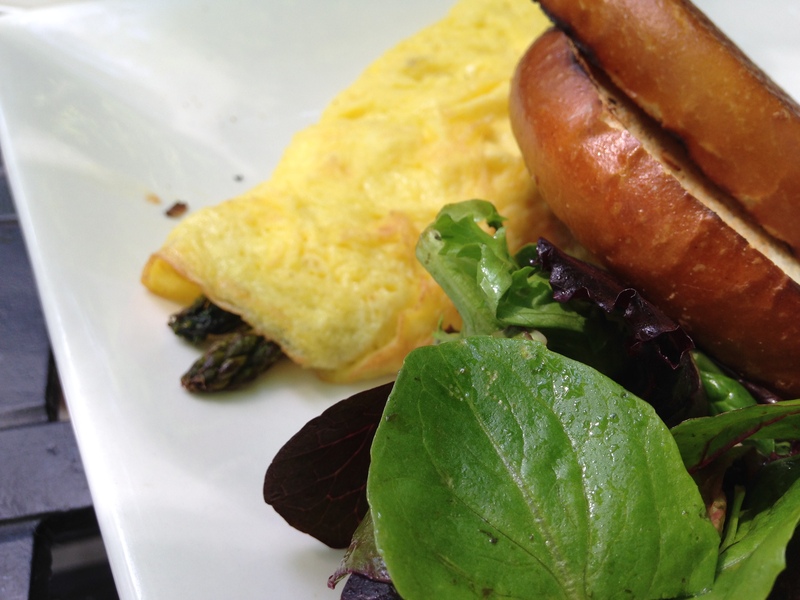 David opted for the Steamed Asparagus and Goat Cheese Omelette ($14) and was not disappointed. Okay, omelettes seem simple but can be a disastrous, eggy mess if handled poorly. This one was fluffy, light, and turned by an angel. 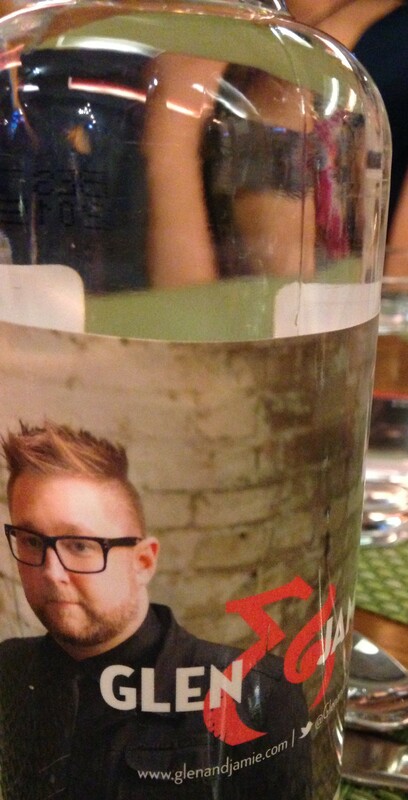 I considered dipping a straw into the Rectory’s trendiest drink for dessert. But I was hesitant… did I really want to sip from a tiny can of Italian sparkling wine made from some royals in Austria that have hit the drinking waves with their Prinz Max Emanuel Thurn und Taxis sparkling bianco? Bucking the trend, I ordered cake instead. The Rectory has a long list of desserts but the best are always, again, the specials made in house by pastry chef Sergio. Even the house-brewed coffee is above average. The only thing that doesn’t seem to work at the Rectory is a rainy day. Most of the seating is al fresco. That’s why I love their website http://therectorycafe.com/ where you can plug into the weather forecast and the ferry schedule instantly to plan a little Riviera in Hogtown this summer season. 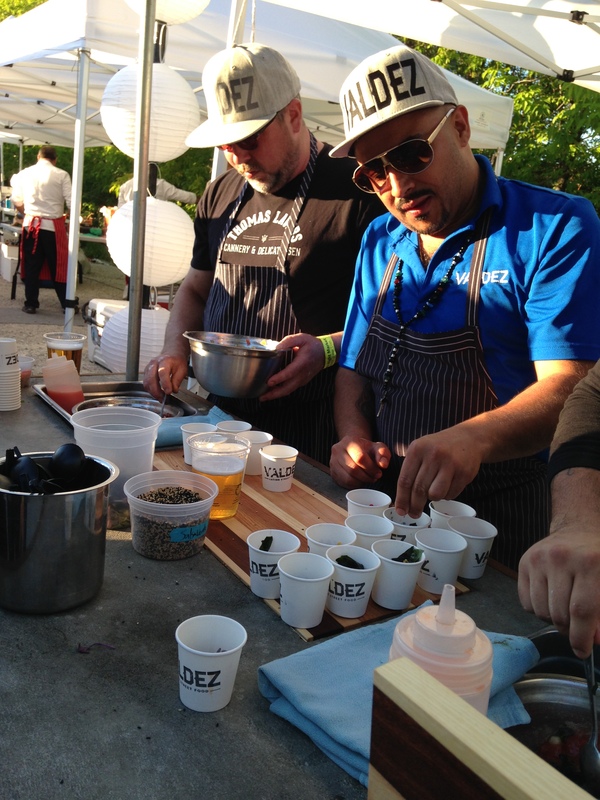 It takes balls or foolhardy abandon to organize an event and call it The Best Dinner Ever. That meant I had to go. For a good cause, my friend Nora twisted my arm and that of others to attend. We donned sparkly, tight evening wear and put on our heels. We tried to look natural – even a little bored – before stepping on the red carpet that was laid out before the entrance. It’s not every day you get flashed by paparazzi enroute to dinner. That was our first clue that this might be the best ever. Second clue: Glen and Jamie. Seconds after a warm handshake with the awesome duo, I was presented a champagne glass shimmering with bubbly Prosecco and topped with a fat, strawberry-slice-floater. A young server wearing a baby-blue tie and crisp, beige shirt held steady both the tray and his smile as I pointed a camera lens in his direction. A bastion of servers stood in the wings, all wearing silk ties that popped off their uniforms in bubble-gum pink, key-lime green and Dijon-mustard yellow. An über clean stainless-steel, open kitchen sparkled in the background offset by an army of tall, white chef hats huddling about. Tonight’s venue was anything but under-staffed. The Chef’s House is a training ground for hospitality workers – servers, bartenders, hosts, cooks and dishwashers all put their lessons into motion here. We were their guinea pigs. And this was an apt pairing when raising awareness and funds for The Peer Project. As newbie chefs-to-be scrambled to plate over a hundred goat cheese soufflé appetizers, equally young-to-the-trade servers brought plates to our table, while others fumbled and squeezed awkwardly around our shoulders to pour Chef House Label Caves Spring chardonnay into our wine glasses. It was a ballet of sorts. Sometimes the pirouettes were graceful and other times, not. Yet none of this deterred the conversation with the young man at my left from being anything less than riveting. Charlie Lo had a small case of the jitters. 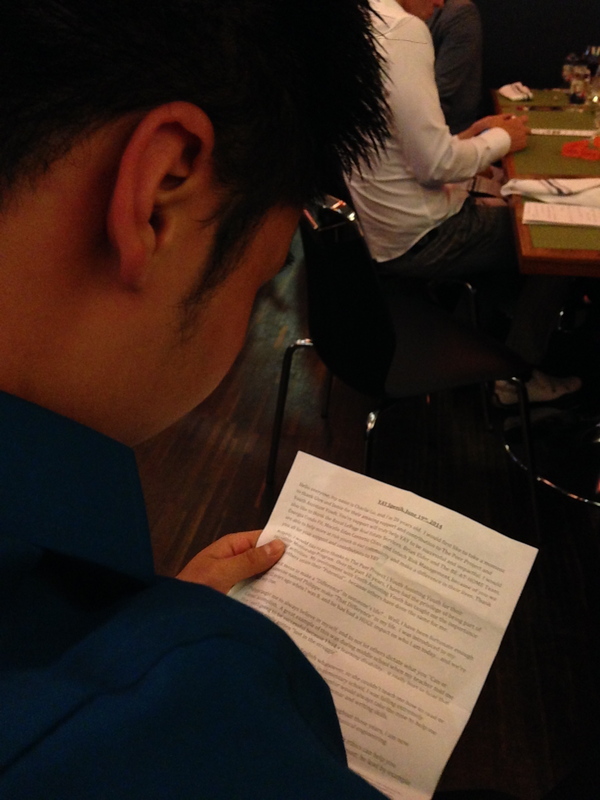 He was about to stand up and give a speech to this hundred-dollar-a-seat-audience and tell us his story. Twelve years ago, a Peer Project mentor coached eight-year-old, fatherless Charlie into believing something radically different than anyone or anything was telling him at the time. He told Charlie to believe in himself, to have dreams and to fight for them. That, despite his learning disability and the uninspired words of his middle school teacher who said he wouldn’t amount to anything. That, despite the support and love of his single mom who was fighting breast cancer and was equally vulnerable, newly immigrated to Toronto and not an English speaker. Charlie’s the kind of guy who will flash you a smile while saying some of the saddest things. He’s got an adorable mannerism of shrugging and squirming about in his shoulders like he’s trying to get out of a straightjacket, then he tosses back his head in relief and you know he’s traded in all that discomfort for a piece of bliss. So I turned to vivacious Laurie on my right and listened how she’d crawled off to Energia Athletics on the Danforth in the middle of the night to cycle through her 3 a.m. volunteer shift at Energia’s annual 24-hour Spin-A-Thon to raise thousands for this very cause. She not only believes in The Peer Project enough to spin through the night, Laurie, a psychologist, refers many of her young clients to this non-profit. 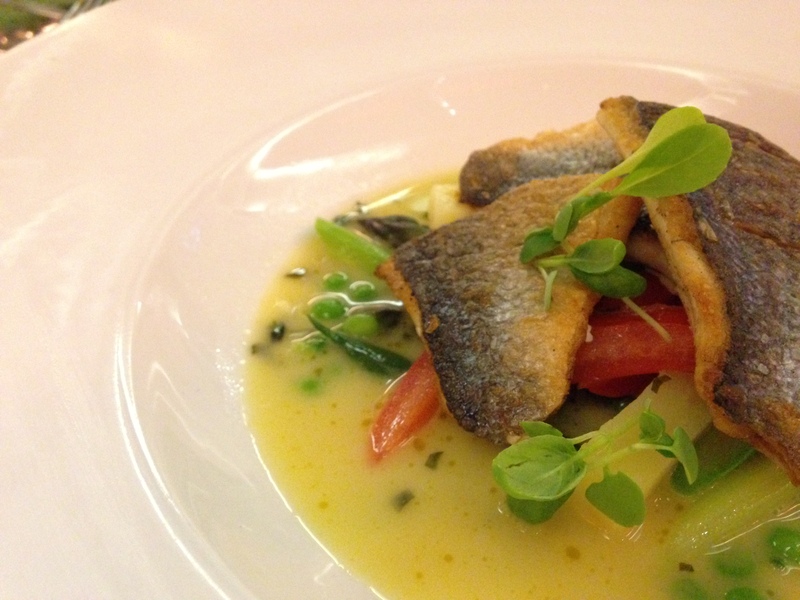 Sadly, the wait-list is long – 400 names long – and thus, the need to fundraise and eat The Best Dinner Ever which had moved into the second and most successful course: seared fillets of sea bream in a tarragon-citrus broth with a tangle of spring veggies. Not everyone at our table had dined at The Chef’s House before. I go so far back that I remember its previous incarnation on the other side of the street, Siegfried’s Dining Room, a much less glitzy, almost stogy venue where I enjoyed many an inexpensive, yet delicious repast served by students. But the problem with students is their timetables, course limitations and school rules – two things that can really get in the way of a long, leisurely meal with endless refills of wine and merriment. 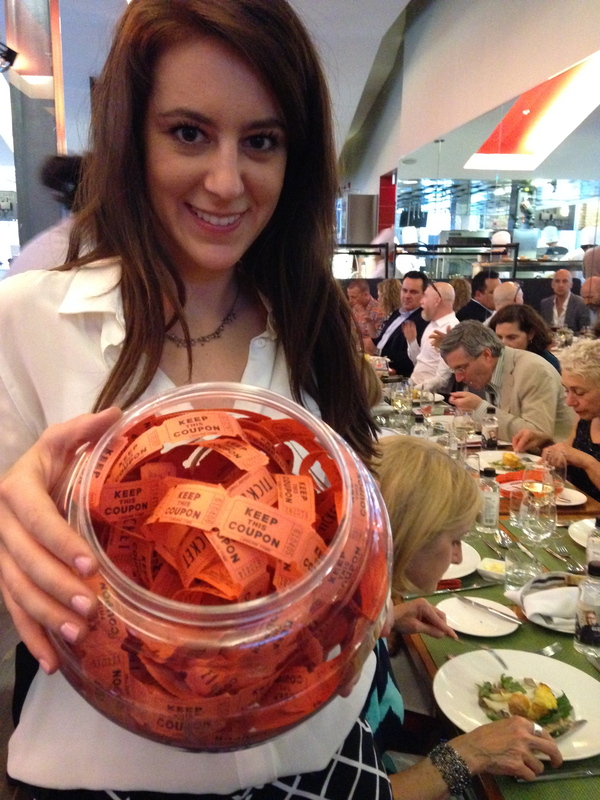 Once the raffle tickets had come and gone, with happy winners racing to claim gift baskets spilling over with chocolate, wine and Bread by Mado (yes, this is a plug) the rest of us losers sat miffed, ready to drown our sorrows. The head instructor delivered the bad news by microphone. Chef’s House was closing shop. According to the institution’s curriculum, it was time for the students to tidy up and go home. Luckily the three-piece jazz trio “The Sixth Street Trio” serenaded us with guitar, bass and saxophone as we trailed out the door, saying farewell to Charlie, The Peer Project and a dinner that was the best for many a philanthropic reason. I’ve been on a fish kick lately, eating it much more regularly than I usually do because truth be told, fish can throw me off my game. Every time I eat a flaky, moist fork-full of perfectly cooked salmon, tilapia or black cod I dive in with true adoration, savouring every mouthful, but the food issues inherent to our finned friends often throw me a curve ball. I get to thinking about their dwindling numbers and feel guilty if there isn’t an Ocean Wise logo nearby. 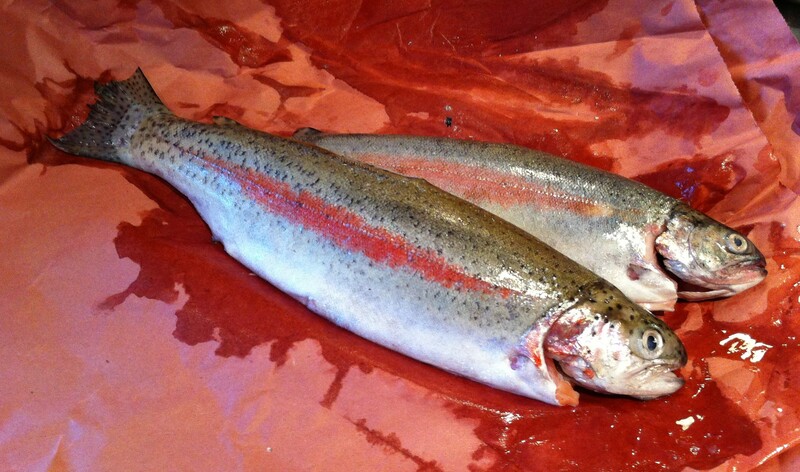 It gets worse when I start to ponder mercury or the high price tag of fresh caught fish. Of late, it’s been canned wild sockeye salmon for my noontime repast. Not only is the provenance of this fish considered as politically correct as you can go, but even the Food Police agree that the bones are edible and calcium rich. Give the can a drain, spritz the lot with fresh lemon juice and lay on the Asian ingredients: finely chopped fresh coriander, green onions and mayo whipped up with a healthy dose of sriracha sauce. Roll it up in a tortilla with some baby greens and few wraps satisfy better. 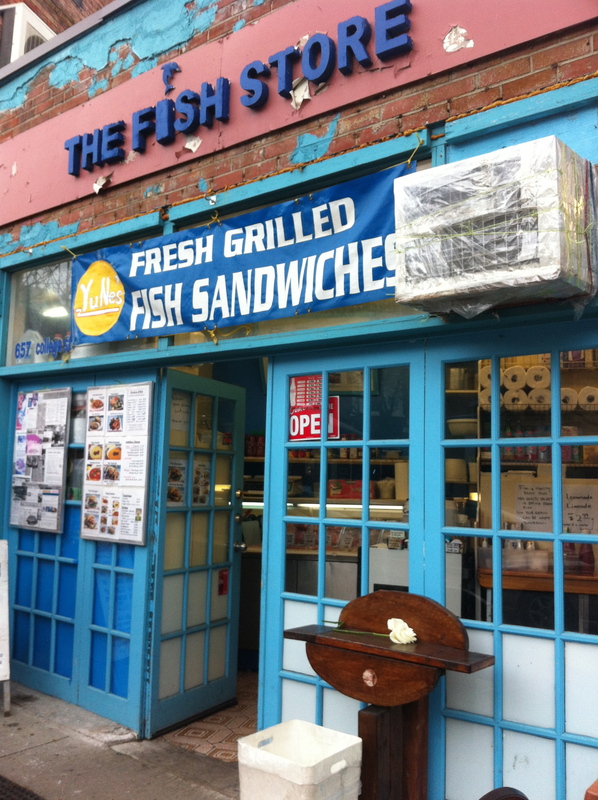 Or ditch the kitchen and head to the numero uno fish shack in town – aptly named- The Fish Store (657 College St. at Grace). Is it a store or a resto? The answer is both and the space is a lot less than you’d think when considering this tandem offering. In fact, summer is the best time to visit as the front patio affords more seating than the closet-sized interior with its two small tables for two. Pull open the door and not two feet away is the cash register with a huge display of fresh fish on ice and another foot away, there’s Chef Mama toiling away. Take your pick: Tuna, shrimp, calamari, wild sockeye salmon, grouper, snapper, tilapia, scallops, halibut and black cod all ready for purchase or cooked à la minute. Despite the lack of space, there’s no lack of signage, advertising a slew of dining options at unbeatable prices, be it sandwich, burrito, salad, tacos or the ”brown rice meal”. No deep fryer to be found here plus a gentle emphasis on good health, from the whole wheat option in the sandwich bun to the brown rice. 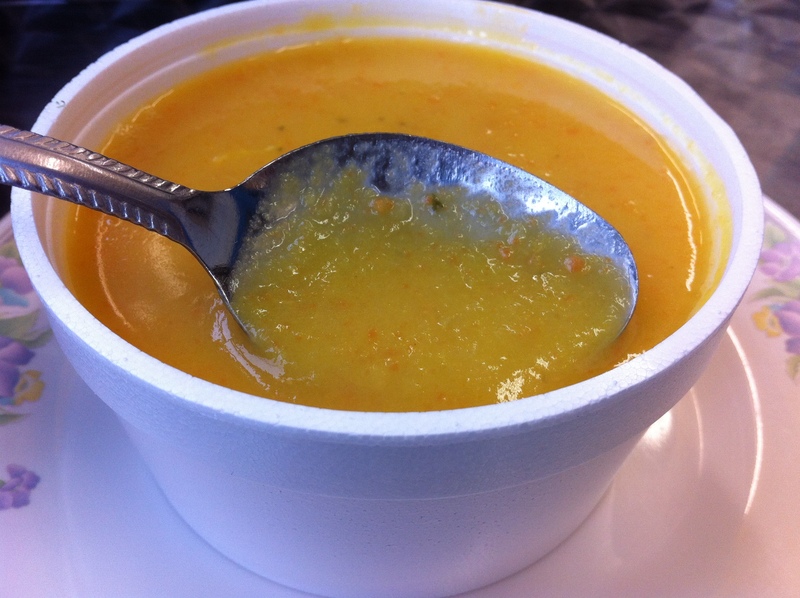 On a recent visit on a cold rainy day, I was warmed by a luscious bowl of butternut squash soup ($3.99) that was perfectly calibrated in both sweet and salty departments and duly rich in deep, squash flavour. I asked Mama for the recipe but she laughed sweetly and declined. Beside her work section is a shelf piled high with their signature paposecos bun (from nearby Golden Wheat bakery) all pre-loaded with sliced tomatoes, red onions and lettuce. 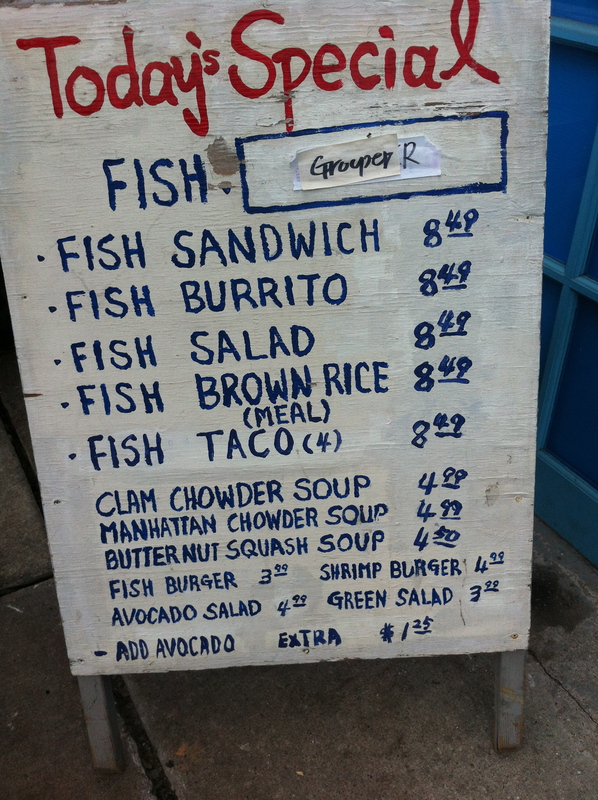 I ordered the day’s special – grouper – and was rewarded with three flash-fried and very fat morsels of silken, juicy fish pillowed in a soft bun draped in a garlicky, tangy vinaigrette. 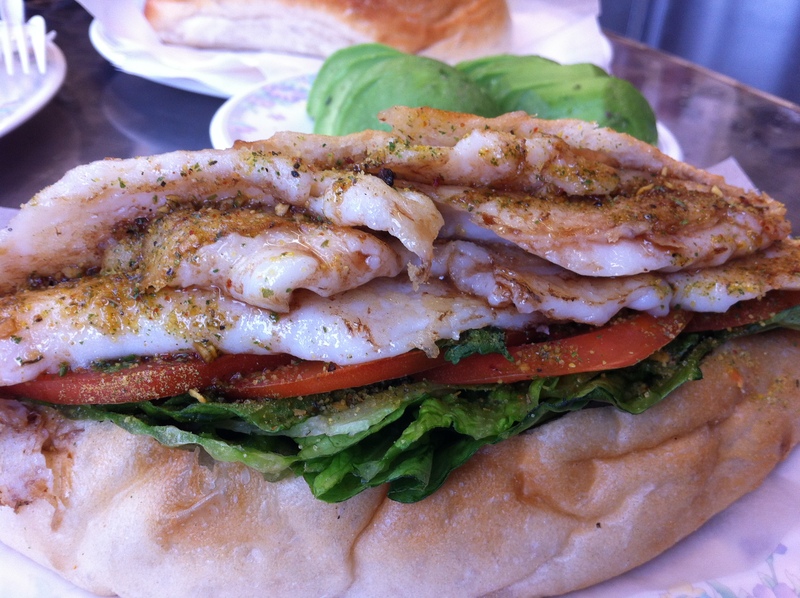 What’s not to love about this combo of hot, insanely fresh fish, mixed up with the soft yeasty bun and the crunch of lettuce? I could imagine ordering several and getting lost in consumption… staring out the sea-blue paned windows of this ultra adorable eatery for hours. 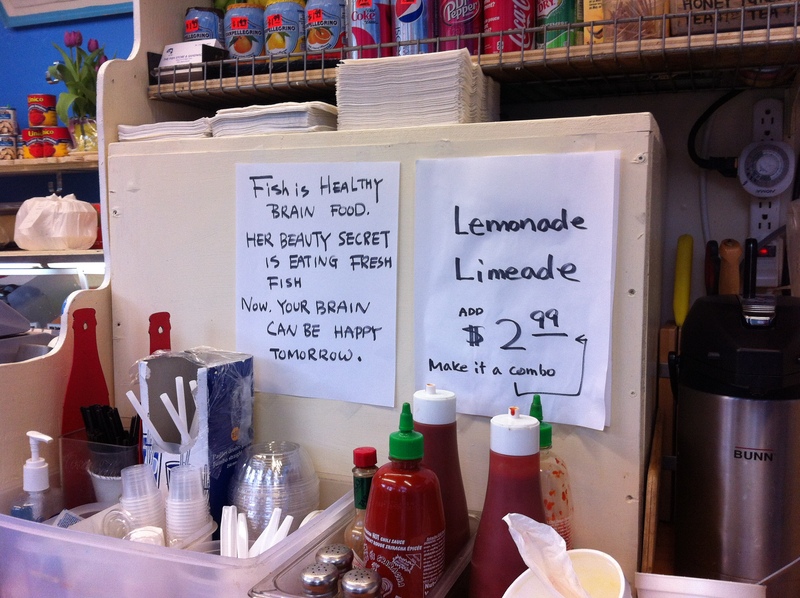 But all good things come to an end and The Fish Store does it aptly. When it’s time to pay at the cash register, Papa Hwang nods down at the tattered edges of a cardboard box full of complimentary pieces of personal-sized gum that he has painstakingly and individually hand cut from a sleeve of Dentyne. I like to oblige him and “ooh and aah” a little between chomps of the gum, saying goodbye to my garlic after-glow but not to the memory of the finest fish sandie in town.